Girls love dolls, and so do collectors. 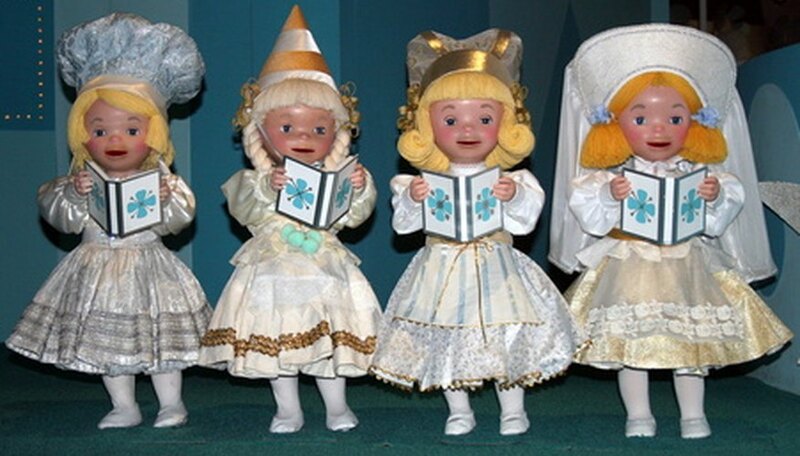 Antique French Bebe dolls can earn a collector as much as $30,000, making doll collecting a highly profitable venture. Antique doll collecting has blurred the borders between hobby collectors and those looking for investment opportunities. Investors, hobbyists or enthusiast have to first learn how to value antique dolls. Being old doesn't make a doll valuable. It also needs to be clean and well-maintained. Wear and tear, dirt and stains lower the value of antique dolls. Dolls wearing their original costumes, carrying the accessories designed by the original manufacturer and still snug in the original box command the highest prices. The rarer and the older a doll, the higher the value. The original manufacturer or artist and their popularity also effect price, according to the Antique-Antiques website. The book value of an antique doll is similar to book value in a car. However, in the world of antique dolls, there isn't a unified consensus on book value. Popularity can change the value of an antique doll overnight. Also, book values for younger dolls often don't take into account condition, as those values are based on the doll never being removed from the box. "Blue Book Dolls and Values" by Jan Foulke has been selling for 30 years and is in 16th edition. New collectors should start learning values from this book. At doll trade shows and shops, collectors can find doll appraisers who can provide a more timely value of an antique doll than a printed book. However, as doll appraiser Debra Gulea writes on her website, there may be discrepancies in valuations from appraiser to appraiser. She says doll shows are a way for collectors to come up with their own appraisals by comparison shopping and price checking. Auction sites provide an up-to-the-minute valuation of dolls, similar to watching stocks. Although prices don't change as often as the stock market, collectors can watch auction sites to see which antique dolls are popular sellers and for what prices they are being purchased. Theriault and eBay are two of the most popular auction sites for antique dolls. Bidders may undervalue these purchases as they often base their bid on a picture, being fully aware there is a chance of deception. Fraud runs rampant in this world and takes advantage of enthusiastic collectors. National Association Doll Dealers Association member Lynn Murray wrote, "From time to time, in the doll world, we become aware of reproductions on the market that are not adequately identified as reproductions and thus mistaken for the genuine article." Technology has made it easier to produce forgeries. Murray proclaims, "The good news is that the doll world is a relatively small world and collectors are quick to share knowledge of reproductions on the market as antiques." Antique-Antiques: What Are My Old Dolls Worth?